You are here: Home » MEDIA » Books » The Furnace (The Tanner Sequence book 1) by Timothy S. Johnston (book review). The Furnace (The Tanner Sequence book 1) by Timothy S. Johnston (book review). Floating in space between the sun and Mercury, Lieutenant Kyle Tanner has only sixteen hours of oxygen left and not enough acceleration to get anywhere useful. Worse, his radiation shielding is toast. He’s dying. But before he goes, he has a story to tell. 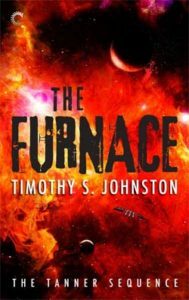 The Furnace (The Tanner Sequence #1) by Timothy S. Johnston (book review). Dispatched to the SOLEX One facility between Mercury and Sol to investigate what might or might not be a murder, Tanner encounters the most baffling case of his career. The death appears accidental, but the body has been tampered with, the head and hands removed. Given identification has already been made, the mutilation makes no sense. Nor do the next two deaths. The two after that make a horrid sort of sense. Tanner is too close to breaking the case and the killer is on the run. I really enjoyed ‘The Furnace’. I read it in two sittings and was not pleased about being told to put the book aside for something as trivial as dinner. So we had guests. I held the fate of fourteen, twelve, no…ten people in my hands. Yeah, at times, the body count escalated about that quickly. The action was tense, the mystery convoluted and interesting and the gore properly gruesome. Johnston held no punches while delivering his tale. The reader will be left with questions at the end. The main mystery is solved before Tanner finds himself drifting at a leisurely three kilometres-per-second through space. The story is greater, however, and the epilogue doesn’t quite sit the lid tight on the pot. That’s fine. To further my little analogy, whatever escapes will be interesting fodder for new adventures. The Science Fiction aspect of the story is just as well done as the mystery. The world is well-constructed and interesting enough to have me reaching for the next book in the series. Tanner’s adventures continue in ‘The Freezer’, released August 25, 2014. The next instalment in ‘The Tanner Sequence’ is due out early 2015. I purchased ‘The Furnace’ at Amazon for only 99c (US). I’m not sure how long this special price will last, but these digital books are only a few dollars when not on sale and well worth the price. « Doctor Who: Robot Of Sherwood by Mark Gattis (TV review).